For years we have known that dolphins have complex sounds and behavior. WDP has a vast database of underwater sounds and behaviors, which have been collected over the past 33 years for this free-ranging community of dolphins. Two initiatives are currently underway with a team at Georgia Institute of Technology. 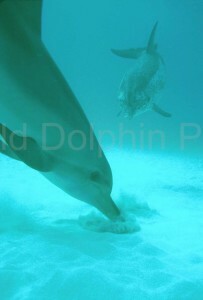 The first is to apply a variety of Machine Learning algorithms to discover patterns in the dolphins sounds. 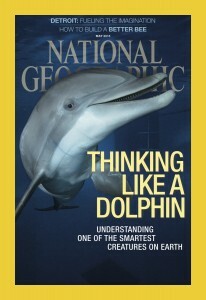 The second is to utilize and underwater computer interface to explore two-way communication between the dolphins and researchers. 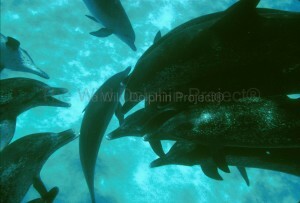 The Wild Dolphin Project is the longest underwater dolphin study in the world. Since 1985, WDP has been tracking and observing resident communities of Atlantic spotted dolphins (Stenella frontalis) and Bottlenose dolphins (Tursiops truncatus) in the Bahamas. Age Classes – Atlantic spotted dolphins gain spots with age, making their age classes easy to identify. Calves are born without spots and gain spots into adulthood. Spotted dolphins can live to around 50 years of age. Mother/Calf Behavior – Unique to the Bahamas is the ability to observe regular underwater behavior. Here a mother encourages a young calf to forage on bottom fish. 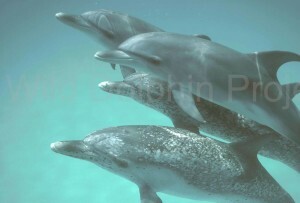 Head to Head Behavior – Like other social mammals, dolphins need to resolve conflicts. A large group of adults goes head to head in an underwater fight, which includes arched body postures, open mouths, and squawking vocalizations. Dolphins make three general types of sounds: Whistles, clicks, and burst pulsed sounds. Whistles are primarily used for long distance communication and as contact calls between mothers and calves when they are separated. Click here to hear a whistle. Clicks are primarily used for orientation and navigation. Clicks usually contain ultrasonic information above human hearing. Click here to hear a click. Burst Pulses are packets of clicks spaced tightly together. These sounds are used during close proximity social behavior such as fighting. Click here to hear a burst pulse.